left, and directed by Jake Brockmann. Three people are working in a sandwich shop when, in an act of defiance, someone is dosed with a hit of acid. Sound interesting? That’s the story told in Drop, a new play presented by the UWEC Players, whose productions are completely written, directed, performed, and designed by students. Drop was written by senior theater major JT Stocks and directed by senior Jake Brockmann, who also has directing experience with First Stage in Milwaukee. 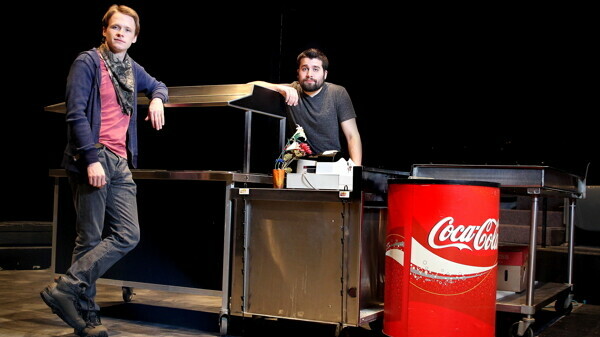 The play features three characters, all employees of the sandwich shop: Seth, a 26-year-old drug addict, played by Michael Renner; Kristi, the manager of the sandwich shop, played by Katie Gaulke; and James, an 18-year-old college freshman, played by Paul Matthews. All exist, in some way, within a prominent drug culture which allows for the older male character to give acid to the younger male character. After working at an inner-city Minneapolis sandwich shop himself at 18, playwright Stocks says he was “catapulted” into an intense drug culture (which he didn’t partake in) that he really didn’t understand at the time. The sandwich shop was right across the street from a dorm for recovering youth addicts, and the nighttime drug use in that part of town was “rampant,” Stocks says. This experience served as an obvious inspiration for Drop. Brockmann admits that when he first read the play, he didn’t really “like” any of the characters. However, seeing the way the actors portrayed the roles, “you really get the humanity,” he adds. Although the UWEC Players has a staff supervisor, assistant theatre professor F. Reed Brown, he only assistants when needed and strongly encourages the use of students’ original work and creative freedom. Other student contributors include Cade Sikora, designer; Tyler Edmonson, lighting; Kyle Featherstone, sound; Logan Toftness, costume designer and assistant director; Emma Brandt and Tabitha Tatro, prop designers; Hannah Farrs, stage manager; and Austin Shimko, assistant stage manager. Brockmann and Stocks also suggest that this production is probably the closest in quality to the university’s main stage shows that UWEC Players has produced. Stocks calls it “a truly complete production with all the bells and whistles.” This is particularly impressive considering the cast has only been rehearsing since Jan. 2, just 15 days before their first performance. To avoid interfering with other university productions and to accommodate cast members’ schedules, the group had about a two-week window in which to choose the play (they voted among four choices), cast it, rehearse it, and perform it. The UWEC Players’ production of Drop will be performed at 7:30 p.m. Thursday, Jan. 17, through Saturday, Jan. 19, and again on Thursday, Jan. 24, through Saturday, Jan. 26, and at 1:30 p.m. Sunday, Jan. 27. Tickets are $5 for students and $7 for the public. The play is approximately 40 minutes long.